College of Education and Human Development researchers contributed to a new study that suggests that patterns of brain activity in high-risk, 6-month-old babies may accurately predict which of them will develop autism spectrum disorder (ASD) at age 2. The new study was published in Science Translational Medicine and led by researchers at the University of North Carolina at Chapel Hill and Washington University School of Medicine in St. Louis. Jed Elison, Ph.D., an assistant professor in the Institute of Child Development, and Jason Wolff, Ph.D., an assistant professor in the Department of Educational Psychology, were study co-authors. The study was conducted by the IBIS Network and funded by the National Institutes of Health. Approximately one out of 68 school-aged children in the U.S. has a diagnosis of autism spectrum disorder, and their younger siblings are at a higher risk of developing the condition. “These findings need to be replicated, but that said, we are very excited about the potential to leverage cutting edge technology to advance the search for the earliest signs of autism,” Elison said. 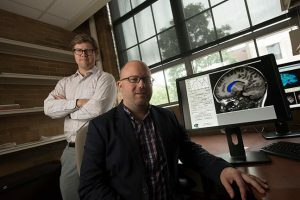 For the study, researchers used magnetic resonance imaging (MRI) to measure the brain’s functional connectivity – or how different brain regions work together – in high-risk, 6-month-old infants. The infants were considered high-risk because they have an older sibling with autism. Overall, 59 high-risk infants were included in the study. Eleven of the infants were diagnosed with ASD at 2 years old and 48 were not. The researchers applied machine learning algorithms to the infants’ brain scans to identify patterns that separated them into the two groups. They then applied the algorithm to each of the infants to predict which infants would later be diagnosed with ASD. The algorithm correctly predicted nine of the 11 infants who were later diagnosed with ASD and all 48 of the infants who were not later diagnosed with the condition. According to the researchers, if replicated, the results could provide a clinically valuable tool for detecting ASD in high-risk infants before symptoms set in. This in turn would allow researchers to test the effectiveness of interventions on a population of high-risk infants who have been identified as having a greater risk of ASD based on their brain scan at 6 months of age. In February 2017, Elison and Wolff contributed to a separate study that used MRI scans of high-risk infants conducted at 6 and 12 months of age to accurately predict which infants would later meet criteria for ASD at age 2. The method used in the new study would only require one scan at 6 months of age.